Using media, and especially the internet, is a right for people with Down’s Syndrome – as the United Nations’ Convention on the Rights of Persons with Disabilities states, everyone should be able to use digital media to participate in society, and this also means children and adolescents with Down’s Syndrome. However, those with Down’s Syndrome face difficulties on various levels when using digital media. They are confronted with technical and structural barriers, cognitive barriers that are caused by developmental delay, or social barriers such as the influence of parents or school. Some users with Down’s Syndrome, for example, have to come very close to the screen (almost all those with Down’s Syndrome are either long- or near-sighted). They may also have problems using the mouse and the keyboard, as their motor skills are often limited. For my research, I met Gilan, a 25-year-old young man with Down’s Syndrome. He told me that pressing the @ symbol on a keyboard was very hard as this meant pressing three keys on a German keyboard that had default settings. Devices are customisable, to a certain degree, so that in Gilan’s case, he could choose his own key combination for the @ symbol which would make it easier for him to press. 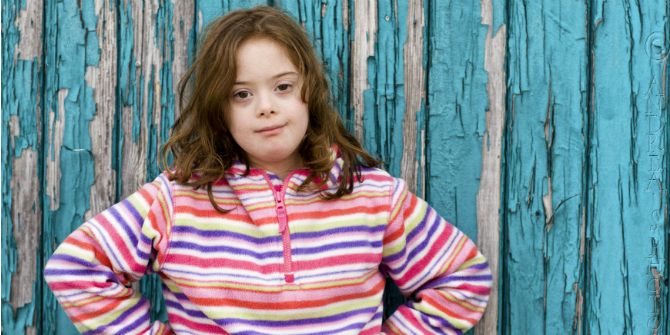 Children and adolescents with Down’s Syndrome also need considerably more time for cognitive development compared to those without Down’s Syndrome. This causes problems in being able to understand the hypertext structure of the internet, which makes navigating the online space more difficult. Not only do children and adolescents with Down’s Syndrome have similar problems as experienced by other young children using the internet, but many of them also use the internet like very young children do. One such problem is cross-media – they try to use links they see on television or audio cassettes to find an online destination. Local communities have an influence on their digital engagement. Although not many children and adolescents with Down’s Syndrome use social networking platforms such as Facebook, a few use the chat app WhatsApp, as they can send messages via voice message, which means they can communicate with other children from their neighbourhood. It is really important for these children and adolescents to be connected with their social environment, because the special schools they go to often have a spacious catchment area, which means that their classmates may live far away from each other, and are rarely able to meet socially after school. these children will therefore be unsure of how to navigate and understand the internet. children with Down’s Syndrome will be more qualified and capable of engaging with the internet. We don’t want to focus on computer use unnecessarily, because Gilan gets along very well. He doesn’t miss anything. Because of his disability he lacks interest in computers…. He doesn’t see the internet as a personal gain. Although Gilan is 25, his mother has not yet shown him how to use the internet – she simply thinks that he gets on well enough without it. Curiously, she tells Gilan to look up information in books while she herself uses an online search engine. With Gilan it is easy or easier to enforce rules. We also tell our 16-year-old son that playing ego-shooter games doesn’t make sense. But he could avoid this restriction easily if he wants to. He can’t play those games at home, but he can play at a friend’s house or maybe even on his smartphone. With Gilan it is easy to keep an eye on him. Nevertheless, some parents do support their children with Down’s Syndrome in learning digital media skills. Anil’s mother, for example, states that the internet is a way for her son to take part in his social environment as he is able to stay connected with the children in his neighbourhood via WhatsApp, so she supports him using digital media. Even if parents want their children with Down’s Syndrome to be independent and to take part in society, it is not easy for them to give their children the opportunity to be somewhat autonomous and self-empowering. Schools and other institutions such as youth centres should support parents by providing digital media skills. By teaching children and adolescents with Down syndrome media literacy, and in particular internet skills, they will get the chance to become more independent and to contribute to organising their everyday lives. For example, they could easily learn how to look up train or bus schedules, or find the local cinema programme. The most important thing parents should heed is that they need not protect their children with Down’s Syndrome from the internet if their children are able to gain the necessary digital media skills to handle the internet well. This means that parents should not hesitate to get help from media educators or someone in their social environment who is media literate. Siblings can also be a great help – they often have more online experience, and can be a great support because they show their siblings with Down’s Syndrome interesting content, and teach them how to navigate around websites.